Innovate Rapidly. Stop wasting time. Be more successful. Address the #1 reason mobile apps fail: the lack of market need for their product? Create clean, consistent mobile interface that also reflects your app’s unique personality? Finish innovative mobile design in less than 3 weeks, with complete confidence that it works? Indeed, and much more. All At the cost of… About $1. For all things mobile, what’s the most effective way to produce a design that works? Hundreds of case studies later, this book contains the answers. From Android Material Design and iOS to Responsive Web Design (RWD) — it’s all here, and it all works. Includes all future editions and updates of this book. This book is the only reference you need to experience first-hand how to “do it all” for our product teams: how to keep your deliverables manageable, keep all of the project “balls” in air, how to communicate results, how to “train” your team so the easy stuff is tackled… and you can work on the creative, fun, HARD STUFF! And that’s just the tip of the iceberg. The book uses a unique “Question & Answer” format to answer 31 key questions, and provides 4 real-world case studies and hours of live-action video. The techniques in $1 Prototype are the EXACT SAME techniques used by Google to create the Material Design “Digital Paper” and to instruct their very select group of startups at Google Ventures. 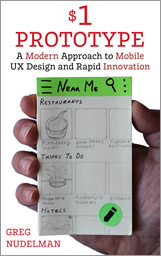 And now you can take these lean, modern mobile innovation techniques and apply them to your own project. New classes. discounts. Free books. No spam.